Although WP-PostViews data can easily be hacked by dishonest writers, and thus is not recommended if you are relying on it for payment purposes, it is a really simple plugin to count visits. 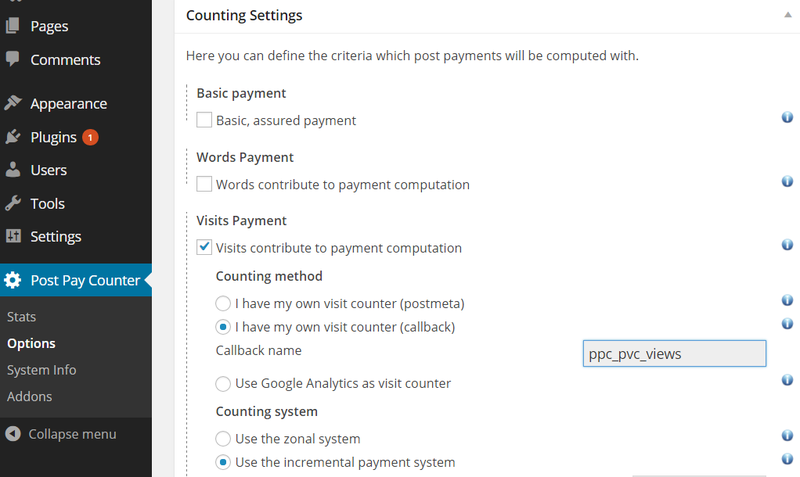 Once you have it installed and active, you need to go to Post Pay Counter > Options > Counting settings > Visits contribute to payment > I have my own visits counter (postmeta) and type views in the Postmeta name field. WP-Slimstat is by far the most complete visits tracking plugin I’ve ever encountered. You can use its data with Post Pay Counter by downloading a little free addon first. Extract the archive and put the file in your /plugins folder, making sure it comes just as a single file and not in a folder. Once you have both plugins installed and active, go to Post Pay Counter > Options > Counting settings > Visits contribute to payment > I have my own visits counter (callback) and type ppc_wp_slimstat_views in the Callback name field. 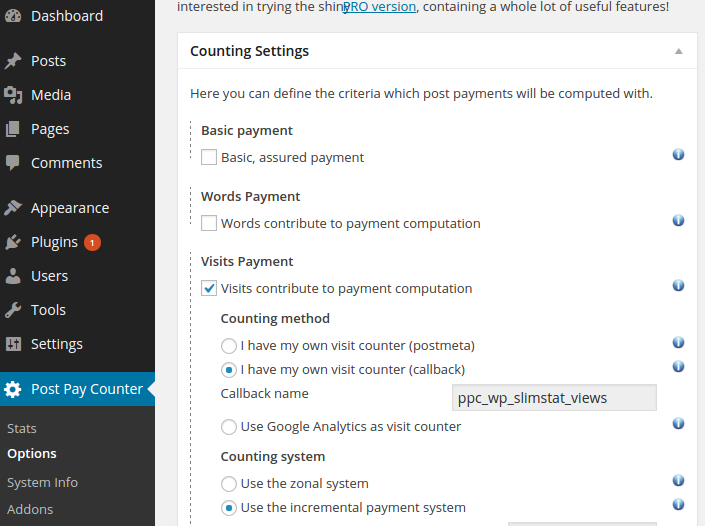 If you are using Post Views Counter to keep track of visits, you need to download a little free addon to Post Pay Counter that will allow the latter to integrate with the former. Once you have both plugins installed and active, go to Post Pay Counter > Options > Counting settings > Visits contribute to payment > I have my own visits counter (callback) and type ppc_pvc_views in the Callback name field. Putting “ppc_pvc_views” in Visits contribute to payment > I have my own visits counter (callback) and type ppc_pvc_views in the Callback name field gives me an error. The specified visits callback returned NULL for a random post – are you sure it is correct? I am using Version 2.505 and I still get that error. I spoke to the Post Views Counter and they said the PHP callback has not changed since release, so I don’t know. I see that now it asks for class name and method name so do we still put only “ppc_pvc_views” in that field? Well that’s embarrassing, I overlook the small add-on that helps with the integration. Sorry for wasting your time. try selecting a wider time frame with the datepicker at the top of the stats page. 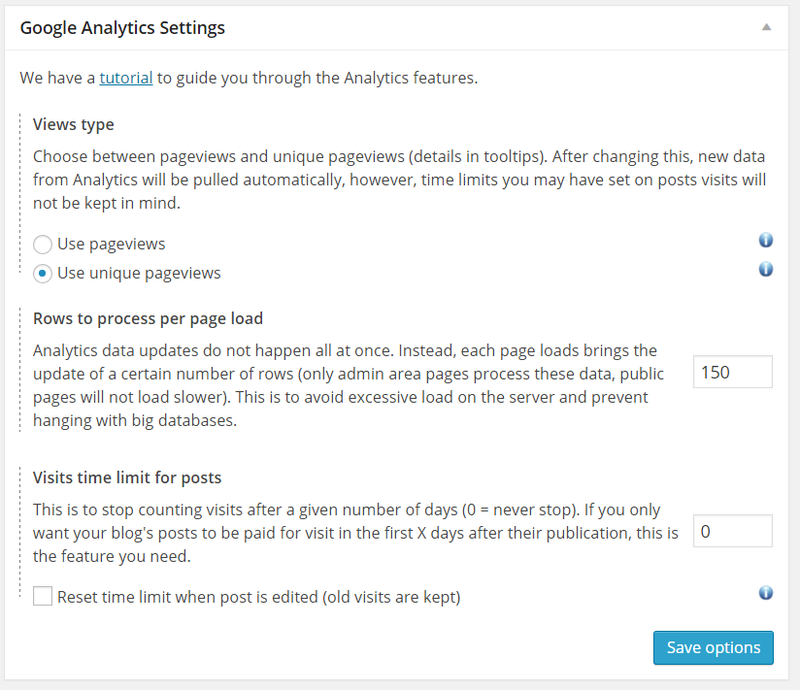 If you still get the error, try to tick the checkbox you find in Options > Permissions > Users can see others’ general stats, and make sure the right post types and user roles are allowed in the Miscellanea box. Does this help? The integration with Slimstat seems doesn’t work. I have installed Slimstat and the little free add-on slimstat integration code, and also typed in ppc_wp_slimstat_views in the Callback name field. Under the Visits Payment option, I choose zonal system and entered 100(views) $1.00 (Payment), but when click on Stats, the written posts indicate as 7, Visits indicates as -7 (0.00) which is a negative value. Is this correct? FYI in my Slimstat access log it shows some views records. I am also having an issue with any comments going toward post paycounter pro. It was working with free version. I will let you know if i figure this one out while you guys are on the walkabout. I’m looking for a way to pay my authors by visit, but with a limited time on each article. So the articles will pay for only 90 days from going live. If a person writes 3 articles per week for example, can I somehow set this plugin to only count hits on the new articles for 90 days and then stop? Everything I’m finding will total up all the hits on an authors articles that month even if they are old, and I can’t find any tool to track article hits daily for just 90 days and then stop. can you help? “The specified visits callback returned NULL for a random post – are you sure it is correct? I have installed the little plugin in the /plugin folder but still get an error. Hi there, is WP-Cron active on your site, or is it disabled for some reason? This plugin is not counting the my website visitors.